Part of Chevy’s Discover The Craft series of baseball-themed videos, this (final) spot details the creation of the baseball glove. A Wilson baseball glove, to be exact. From smooth, flowing lines to soft-touch premium textures, the all-new 2014 Chevrolet Impala has been stylishly-tailored for comfort. This is the story of a glove. Before taking the field, the groundwork starts here, where 35 people make over 180 gloves a day, hand by hand, pound by pound, with diligent precision, and focused rhythm. Every lace securely fastened, accurately measured, and 80 pieces of fabric tightly looped together to ensure the proper fit and form. No machine can do this. This is fine hand craftsmanship. Only the highest quality of raw materials are used, embossed with the most trusted brand of gloves in Major League Baseball. Because whether you’re a pro athlete running down a fly ball, or in little league, eagerly waiting in the outfield, the desire is the same: making the catch. And it all starts with the leather, and the keen eye of a skilled cutter who thoughtfully selects the best part of the hide. Although the glove of one player may make the winning catch, here’s to all the other hands that go into making that moment possible. Wilson gloves made in China! I’ll take my Rawlings over that chinsey piece of &@-: any day! Wilson is giving us the finger. 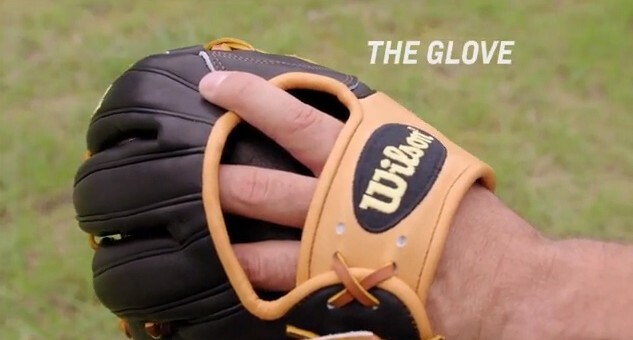 Chinese made baseball gloves to peddle an American car. What’s next?